A Monthly Magazine, the Medium's True Friend. Devoted to the Interests of Mediumship, Spiritualism, Liberalism and Nationalism. Elmwood Place, OH; Detroit, MI; Chicago, IL. Publisher: Bliss & Burwell. Editor: James A. [Albert] Bliss and Mrs. Bliss; Cora L. Bliss and Herman Burose. 1/1, 1889-1895. 24-32 pp., $1.00 a year ($2.00 for a year's subscription, Life Membership in the N.D.C., and a Beautiful Chart). Volume 1, no. 12 of the n.s. is also called 3/8 of the old series and labeled "N.D.C. Year 8." James A. Bliss died in 1890 but the journal continued under his wife's ownership after a hiatus. The journal's stated purpose was to be "an advocate of the Equal rights of Man and Woman, demanding justice for the latter; that she may receive equal wages with man when she performs the same work. Its aim is the enlightenment of the human family through educated mediumship, and it seeks to develop sensitives to fill positions in public mediumship. It will avoid the fraudulent and defend the genuine every time." 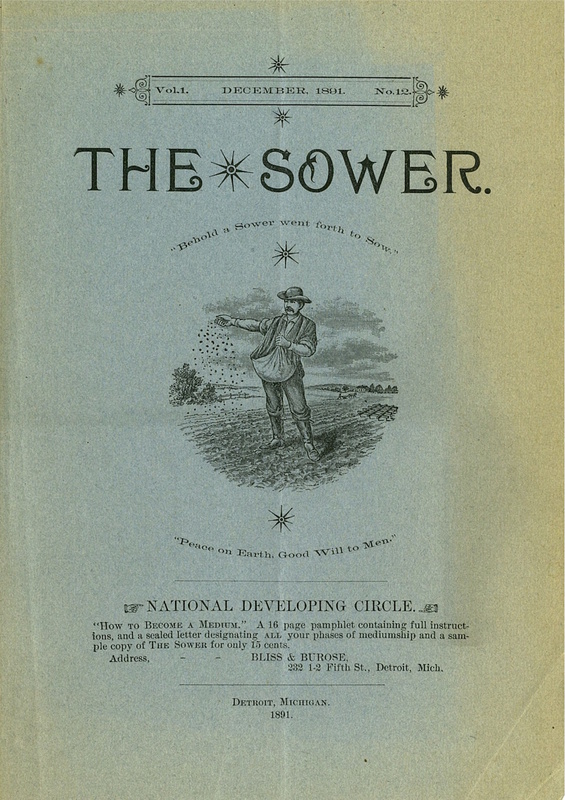 Banner of Light 64/17 (January 5, 1889): 3. In practice, especially after the death of Bliss, the journal largely consisted of political exhortations on the plight of labor and discourses on Edward Bellamy's Nationalism, together with letters from satisfied members of the N.D.C. and occasional lectures by the guides of Cora Richmond and others. Contributions by Alonzo Danforth, editor of the Temple Messenger Department, Alonzo Hollister, Jane D. Churchill (messages from the "Messiah of Chemistry"), and others, and prominent advertisements for Bliss' "How to Become a Medium" and "N.D.C. Magnetized Plates," and for psychic readings and healing, magnetized paper and magnetized slates, "Vitapathy, the New System of Practice," and "Dr. A.C. Williams, the noted Prophetic medium." On the Blisses, see the note under Quarterly Advance and Review. Amherst College; NSAC Lily Dale (bound volume with Temple Messenger).